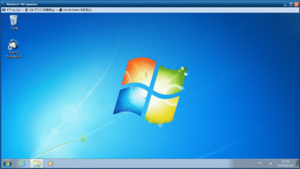 The virtual desktop environment (Windows) is the Windows virtual desktop environment provided by the infrastructure center. Windows desktop environment can be used almost the same as a physical personal computer. 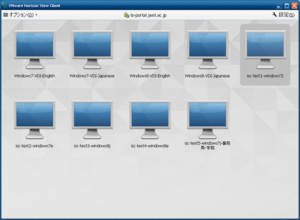 The virtual desktop environment can be freely used at any time from the thin client terminal distributed by the center, personal computer, tablet, etc. 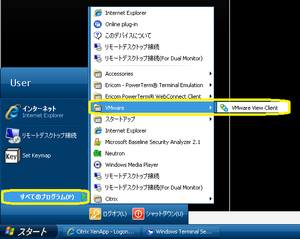 Different versions can be used by selecting Windows 7 or 8. This virtual desktop environment is centrally managed by the infrastructure center and automatic backup is also maintained. In addition, software applications useful for research are pre-installed. Here, we will briefly explain how to use the Windows virtual desktop environment provided by the infrastructure center. 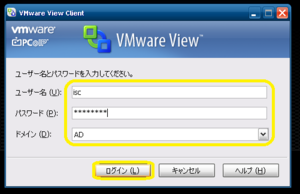 You can connect using VMWare Horizon View Client. In addition to thin clients, you can connect from your PC, Mac, iOS, Android etc. Turn on the thin client. After startup, the desktop screen shown in the figure is displayed. "ts-portal.jaist.ac.jp" will be displayed as the connection destination server, please select it. When you select the destination server, the login screen will be displayed. the domain as it is "AD". After logging in, the available OS versions will be displayed. The figure is an example. After you select the environment to use, the corresponding desktop will be displayed. ※ If you get a message as "You are not entitled to use the system" instead of the screen shown, please contact the Information Society Infrastructure Research Center (e-mail: isc-query@jaist.ac.jp). That doesn't include those administrative staff and those using the administrative system TS, 2014/11. After logging in, the desktop environment will be displayed as shown in the figure. 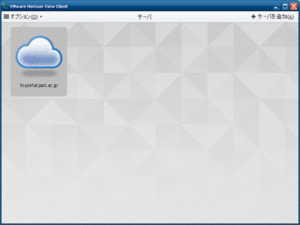 In addition to thin clients, JAIST cloud desktop can be used from various devices such as Mac, Linux, iPad, and Android. Here, we will explain how to connect and prepare other devices. 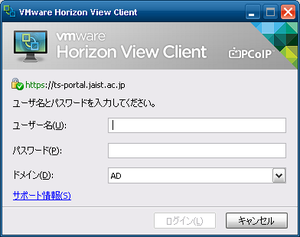 Please download the software application "Horizon View Client" from VMware's download site and install it. * If you can not download, change the country displayed in the upper left to United States (United States) and try accessing the above URL again. ４．Please select which desktop environment you want to use. From the start menu, please select shutdown or logoff. The viewer is closed. 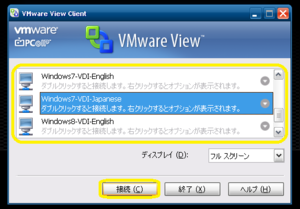 Then disconnect the VMWare Horizon View Client.